18 This is how the birth of Jesus the Messiah came about: His mother Mary was pledged to be married to Joseph, but before they came together, she was found to be pregnant through the Holy Spirit. 19 Because Joseph her husband was faithful to the law, and yetdid not want to expose her to public disgrace, he had in mind to divorce her quietly. The word Magi usually refers to Zoroastrian priests. In Greco-Roman usage the term Magi had connotations of magicians or sorsorers, exotic figures from distant lands. It is not clear just who the Magi actually were. They may indeed have been Zoroastrians. The references to the Star of Bethlehem suggest that they may have been astrologers. The Babylonians had a reputation for being skilled in astrology and magic so the Magi may have come from Mesopotamia. They may also have been Jewish since they were seeking for a king of the Jews. The fact that they were unfamiliar with the prophets may prove that they were Gentiles. The number of the Magi is not given in the Gospel. The reason that three are usually pictured is that there were three gifts; gold, frankincense,and myrrh. It is also not clear just what the Star of Bethlehem actually was. There have been several theories presented, but none of them are entirely satisfactory. The star might have been a supernova, perhaps in a nearby galaxy. There is no way to know for certain since any supernova remnant so far away would be difficult, perhaps impossible, to detect. It might also have been a comet. This is rather unlikely. Although a comet would behave much as the star is said to behave, hanging in the sky over a certain location for several nights, comets were universally perceived as being harbingers of disaster in ancient, and not so ancient, times. The most likely explanation is a conjunction of the planets Jupiter and Saturn. The astronomer Keppler discovered that there was indeed such a conjunction in the year 7 BC. The following year there was another conjunction of Mars, Jupiter, and Saturn. This might have been very impressive to the Magi. It may also be that the Star was a supernatural phenomonem and one that cannot be studied today. Whatever the truth of the matter is, I hope everyone has a wonderful Christmas. The word Magi usually refers to Zoroastrian priests. In Greco-Roman usage the term Magi had connotations of magicians or sorcerers, exotic figures from distant lands. It is not clear just who the Magi in the Gospel actually were. They may indeed have been Zoroastrians. The references to the Star of Bethlehem suggest that they may have been astrologers. The Babylonians had a reputation for being skilled in astrology and magic so the Magi may have come from Mesopotamia. They may also have been Jewish since they were seeking for a king of the Jews. The fact that they were unfamiliar with the prophets may prove that they were Gentiles. The number of the Magi is not given in the Gospel. 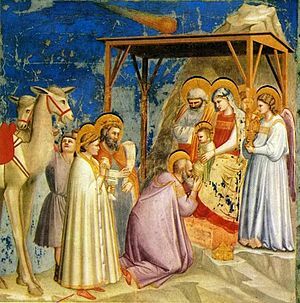 The reason that three are usually pictured is that there were three gifts; gold, frankincense,and myrrh. It is also not clear just what the Star of Bethlehem actually was. There have been several theories presented, but none of them are entirely satisfactory. The star might have been a supernova, perhaps in a nearby galaxy. There is no way to know for certain since any supernova remnant so far away would be difficult, perhaps impossible, to detect. It might also have been a comet. This is rather unlikely. Although a comet would behave much as the star is said to behave, hanging in the sky over a certain location for several nights, comets were universally perceived as being harbingers of disaster in ancient, and not so ancient, times. The most likely explanation is a conjunction of the planets Jupiter and Saturn. The astronomer Kepler discovered that there was indeed such a conjunction in the year 7 BC. The following year there was another conjunction of Mars, Jupiter, and Saturn. This might have been very impressive to the Magi. It may also be that the Star was a supernatural phenomenon and one that cannot be studied today. Whatever the truth of the matter is, I hope everyone has a wonderful Christmas.